RE/MAX Diamond has recently made a donation of $5,902.00 to Children’s Specialized Hospital! 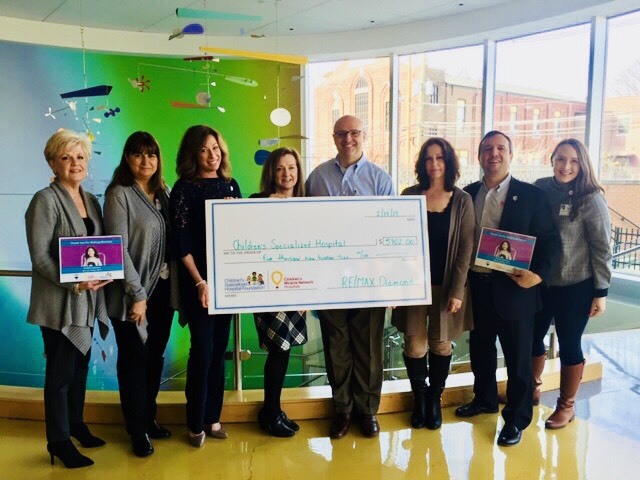 Since 1992, RE/MAX and Children’s Miracle Network Hospitals across the U.S. and Canada have partnered to support millions of children each year by raising hundreds of millions of dollars to date, with local hospitals determining where funds are needed most. All over the country, RE/MAX agents make a difference in their communities – volunteering, donating money, contributing time and ultimately changing lives. The funds donated by RE/MAX Diamond will benefit the Unreimbursed Family Care Program at Children’s Specialized Hospital. This program helps make up the financial difference between the rehabilitation a child needs, and what his or her family’s insurance will cover. Thank you RE/MAX Diamond for all of your support! Previous post: Celebrate the 1st day of Spring with DQ on March 20th! Next post: CMN Hospital’s NJ 4th Annual Miracle Summit!